Has anyone who was not a Muji owner prior to one of my several Muji reviews actually bought one of these pens? That's kind of the issue, isn't it? If you don't live near a Muji store, they are difficult to come by. Either pay high shipping fees for very inexpensive pens, or go the ebay route and pay a bit of a premium to acquire them. I almost hate to heap the praise on them because they are so hard to get a hold of. But praise them I will, especially when readers keep sending them to me (thanks Carmen!). My favorite thing about them is the sharpness of the line. That does come at a price - they can get a little scratchy like most micro tips - but as I discussed in the All Questions Answered post, that is something I am willing to live with for otherwise exceptional performance. The retractable model as shown in the picture is my favorite, preferably with the brushed plastic barrel (this one is smooth). The blue ink is similar to Uni-Ball and Pilot inks despite the fact that the photo is a bit washed out. Despite looking generic, they seem well made, and the ones I have had for a year or two are no worse for wear. All in all, you can never have too much of a good thing, even if they are a challenge to acquire. 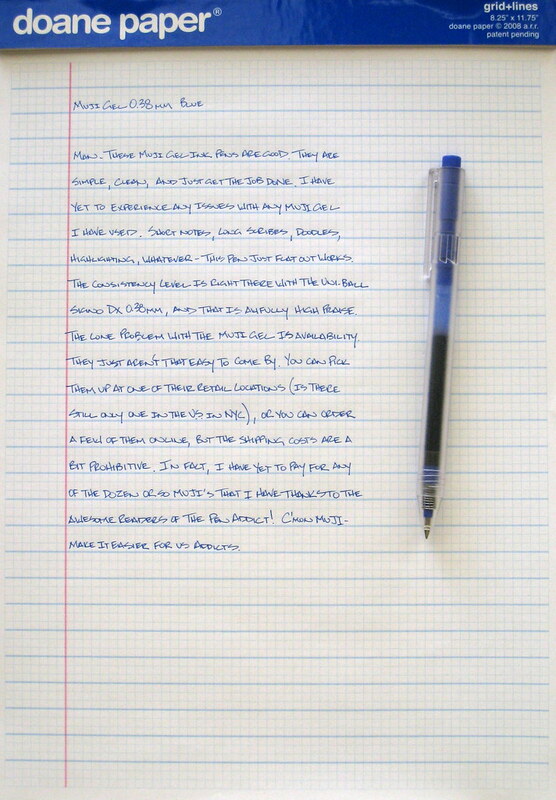 Posted on October 8, 2010 by Brad Dowdy and filed under Muji, Pen Reviews.